Everyone 'knows' who or what Stanton Friedman is. He's probably as close as anyone has gotten to being a household name with regard to UFOs. Even not knowing his name, but seeing his picture, is to automatically go, "Oh yeah... right... ...the 'UFO' guy." Stanton Friedman is an evidential cherry picker, a self-involved fantasist, and an inventive conspiracy monger/hoaxer. Stanton Friedman is a frustrated old man with delusions of grandeur and a messianic complex. Stanton Friedman is ~not~ real. So would say those who speak in persuasive proclamation, 'mainstream' declaration, media decree, and 'official' edict. But hold on. The thing about proclamations, declarations, decrees, and edicts is that they don't need to be true; they only have to be compelling. They only have to sew a seed of doubt... ironically nourished by the "information void" they help to maintain, it's enough to preclude further action. The goal, to be blunt. Forgetting, entirely, their opposing character, is there any other difference between these preceding proclamation sets? Paul Kimball, a serious filmmaker with his own production company, has produced some engaging and instructive documentary films providing the requisite basis for just this kind of supposition. The well crafted documentaries referenced here include Kimball's "Stanton Friedman Is Real" (a sober examination of Stanton Friedman the 'man') and "Do You Believe In Majic" (A Doc regarding alleged quality documentation indicating, among other astonishing things, ~very~ high levels of official interest in the ExtraTerrestrial Hypothesis... as it pertains to UFOs). These films show, with some clarity and fairness, where more of the truth in this... very twitchy and ephemeral area... must be! This is forgetting the balanced cameo they provide Stanton Friedman, despite, I do not hesitate to point out, any conflicts of interest possible. I suspect any conjectured conflicts are abundantly accounted for. Kimball's relationship by marriage to Friedman's family has Kimball erring on the side of Friedman's opposition, if anything. It remains that this writer's gut-sense advises that Kimball is legitimately trying to shoot straight-down-the-middle on the issues. Too bad for Friedman's opposition. A 'fair' look makes ~them~ look pretty bad. Humiliatingly so. 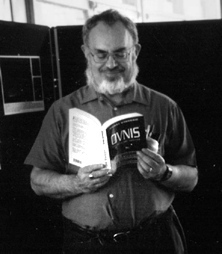 The pros and cons regarding a ufological contribution by Stanton Friedman do not balance in actuality, even as Kimball's films very assiduously give equal time to the positions of both sides... obvious sincerity shown by Kimball, a man trying to arrive at some kind of non-anticipatory conclusion on the matter, or at least a step forward and not back. Which side of the argument ~does~ succeed in outweighing the other? The viewer can make up his or her own mind... but this writer perceives that the 'cons' see far before them what 'pros' leave far behind... The cons have little weight it seems. Along similar lines, I've heard no protestations from this opposition -- no cries of "foul" or angry wounded remonstrations regarding a misrepresentation of their assumptive, biased, canted, and homocentric views; their convenient attitudes; their conflicted opinions. The point is whittled, admittedly, pretty fine. The presumption is that, to date, the opposition feels that it was fairly characterized by Kimball's films, and that oppositional views, such as they are and have always been (...continue to be! ), were squarely portrayed and accurately recounted. One would presume. The irony is that it ~was~ squarely portrayed and accurately recounted. They ~got~ their best shot! In comparison with Stanton Friedman, though, they fall way short -- their meager shell won't even clear the gun tube. This is ~despite~ the huge amounts of powder provided by the hijacked mainstream to get that round down range. This is further illustrated by the ease with which Friedman will dispatch the occasional brave (if haplessly clueless) soul who gathers up the sack required to join the long list of "noisy negativists" crushed, decisively, in debate with him. There are numerous examples of same on Kimball's films. Dispute Stanton Friedman on the issues, bunky, and scamper from a righteous fray with your tail tucked between your legs making whipped-puppy-Ned-Beatty noises... I digress. Flatly, the arguments of Friedman's opposition make assumptions based on contrived ignorance, intellectual infidelity, obstinate illogic, wishful thinking, denied fear, and rank complacency. They are arguments larded with confident sounding if baseless assertions based on varying tinctures of the preceding six performance indicators, and they only serve to provide for what, in the final analysis, can only be sack-less cowardice -- intellectual and otherwise. Such is, and has been, the ongoing prosecution of the arguments from the opposition. It soberly expounds that the already unlikely alien cannot get here because we cannot get there, only inventing a comforting rubric they can use to keep their intellectual distance from them. It is quick to label the ufologically affected individual as a mis-representer of the facts (a LIAR), a mis-understander of the facts (a DOPE), or as one too mentally incapacitated to appreciate the facts (a NUT). To the opposition, there is, or can be (...of needs! ), ~no~ 4th possibility. To this klasskurtxian and pelicanistic opposition, people who see UFOs are, unquestioningly and absolutely, "M" cubed (Misleading, Mistaken or Mentally ill), and we ~are~ alone in our little corner of the multi-verse. ...Perhaps (...pray hard to your fundamentalist god of choice! ), even alone in the whole damn thing... a centerpiece jewel in God's crown of creation, ideally! Intelligent alien beings might ~possibly~ exist in some other galaxy, or even at the other end of this one... but not here... Oh please, god... not here. No! There ~is~ a 4th choice. Verily, there is a plethora... a panoply of 'choices'! These are choices that must come as a result of following the data where it leads and not where it can be driven. These are choices that one discovers as one pursues the devil in the details (as Friedman has for four decades!) and still be able to hold that evidentiary demon by reluctantly slippery shirttails! These are choices that remain after one is able to appreciate the vast amount of evidence extant (as Friedman has) that is physical, historical, photographic, anecdotal, and even personal. These are choices one can accept when one sees past the end of a conflicted little nose (as Friedman has), removes oneself from ones convenient and unfounded prejudices (as Friedman has), or objects to and rejects ones self-imbued and pettily contrived ignorance (as Friedman has). Freidman has a long, long history of perspicaciously, perceptively, and intelligently trying to get it down... right. We are not alone. Not now. Not ever. Admitting the preceding is to step to the future. Denying it is an impossible and so disastrous retreat to a lost, and even invented or imagined, past. Paul Kimball is clear in his films that Friedman is very specific and precise about why he says what he says. Not content to sit in a comfy spot and airily spew puerile pronouncements of outdated and discredited "conventional wisdom" like his critics, Friedman chases details that squirm and shift in his grasp, details handily discrediting the 'official' version of puzzling events and/or corrupting, otherwise, what should be a cogent record of same. Rare bird he. We're lucky to have him. Stanton Friedman is thorough. His critics are only thorough enough with regard to their assertions to sew a fallacious seed of doubt or allow for a plausible deniability to obscure the ufological issue du jour. This is not honorable, on any level, and apes the activities of the propagandist, despot, axe-grinder, canted lobbyist, or spin-doctor. Friedman is organized, objective, constructive, and comprehensive. His critics are none of these things and are shot down in flames when they meet him in the air for formal argument on the points of it. Friedman is flexible, acceptable, specific, and thoughtful regarding the ufological. His critics prosecute the opposites of these things, and use every fallacious trick they can to discount him, invalidate him, and discredit him. Even honor and character have been smarmily attacked, reader! ...Et tu, Peter Jennings, and a mark on your legacy, Sir. Point one finger and risk three back at yourself, boyo! Contrarily, Kimball's compelling film "Do You Believe In Majic," dismissing the recent Jennings/ABC whitewash as patently false and a mockery of what a documentary (...a "mockumentary"!) should be, is a good case in point. Every point skeptically raised against the verity of the MJ-12 Documents (...as clear evidence of the Extraterrestrial Hypothesis with regard to UFOs, and an admitted high level ufological interest in the ~reality~ of same...) is dissolved, handily, by citation -- chapter and verse. Truly, these defensively reflexive protests do not hold up upon examination, Kimball is able to show. They are bluster, illogic, ignorance, complacency, bias, and cant. Friedman, on the other hand, can provide clear and compelling evidence that the documents are, indeed, real. His critics have nothing remaining in their moldy corner but strident, officiously vicious, and patently unsupported negativity. One set is of 'proclamations' is based on solid reputation, diligent research, pains-taking fact finding, unblemished integrity, tuned intelligence, and verified results. The other set is based on 'mainstream' flatus or klasskurtxian hot air. The reader can judge for themselves which is which. Be that as it may, Stanton Friedman, in a final analysis, ~is~ real, in this writer's view, and one wastes no time, at all, believing in MAJIC. Step forward to the future, reader, not backward to futility.